Cedar Crest College demonstrates a profound commitment to the arts, as evidenced in our modern studio space and equipment, the unique courses we offer (including one focused entirely on women artists), and our numerous galleries and studios. While concentrating on artistic techniques and style, we also focus on the emotions and experiences that fuel an artist’s perspective and interpretation. Here, you will be welcomed into a close-knit community of student and faculty artists, who will support you as you broaden your skill set and develop your own artistic voice and style. Our small class sizes mean that our professors are able to spend more time with each student, providing a personal level of mentoring that is unheard of at most other schools. Here you will receive a broader artistic education: In your first semesters, you will be exposed to a wide variety of media—including paper making, jewelry making, raku firing, metal casting, welding, book arts, painting and drawing. Later, you will select one or two media in which to immerse yourself and fine-tune your skills, preparing you for a future career as a professional artist or as a health care professional who utilizes the creation of artwork as a therapeutic tool. Graduates from our art and art therapy programs have gone on to successful careers as artists, teachers, art therapists, jewelers and ceramists. They hold rewarding positions in some of the most notable advertising agencies, architectural firms, galleries and museums. Others have been accepted into the finest master’s programs in the nation, including ones at Savannah College of Art and Design, Seton Hill University, and Maryland Institute College of Art. All of our professors are practicing artists who have current exhibition records and work in a wide variety of media. They are dedicated to providing personalized advisement to students at every level. Our students and faculty are constantly engaged in the sharing of ideas and inspiration. We even offer a Living Learning Community, called CREATE, in which students who share their interest in the visual arts also share a dorm. Our College offers a wider variety of media than any other college in the Lehigh Valley. Our campus is home to painting and drawing studios, raku kilns, a foundry, welding facilities, a ceramics studio, a jewelry studio, and facilities for book arts and papermaking. We also have a dedicated studio space for seniors. In your early semesters, you will explore a wide variety of media, enabling you to broaden your artistic experience. You will also receive a well-rounded liberal arts education, providing you with the diverse background necessary to adapt to an ever-changing job market. The galleries at Cedar Crest College host six shows a year, including one in summer. Nationally acclaimed artists bring their artwork—and insight—to the campus and install their work with the assistance of the students. 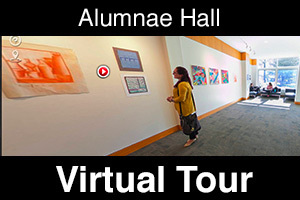 Art students at the College are encouraged to exhibit their work to the campus community. Beginning your first semester, you may submit original works of art or photography to our student-run publication: Pitch: A Journal of Arts and Literature. Many art majors also participate in a Senior Art Exhibition. During your time here, you will create a variety of finished portfolio pieces that are suitable to show to a prospective employer or graduate school. If you major in art and art therapy, you will be required to participate in a portfolio review once each semester, during which you will receive feedback and learn how to present your artwork to others. Our picturesque campus is a nationally registered arboretum and provides the perfect setting for fostering and developing your creativity. Also, our proximity to the major metropolitan areas of Philadelphia and New York City allows for regular College excursions to urban galleries and museums, providing you with enrichment through access to a broader art world. students with the tools to engage in processes and techniques that prepare them to visually communicate independent ideas that are informed by historical, cultural and artistic references. curriculum that encourages individual expression and prepares innovative leaders to engage in creative thinking and problem solving based upon the interconnectedness of the liberal arts. art experiences that enhance an understanding of the integrated nature of learning in a liberal arts environment and to provide those who choose the visual arts as a primary focus with the means to reach a high level of experience. arts based resources including exhibitions, residencies and student initiated programs for the enrichment of artistic culture of the college and local community.